Vietnam and Mongolia should exert more efforts to increase political trust, expand economic cooperation and closely coordinate at multilateral forums, Foreign Minister Pham Binh Minh has told his visiting Mongolian counterpart Tsend Munkh-Orgil during their talks on April 4 in Hanoi. Minh, who is also Deputy Prime Minister, affirmed that Vietnam attaches importance to reinforcing and enhancing its traditional friendship and cooperation with Mongolia. He stressed that Vietnam is willing to work with the Mongolian side to increase high-level exchanges and meetings, and effectively implement agreements and common perceptions reached between the two countries’ senior officials during Prime Minister Nguyen Xuan Phuc’s visit to Mongolia in last July. 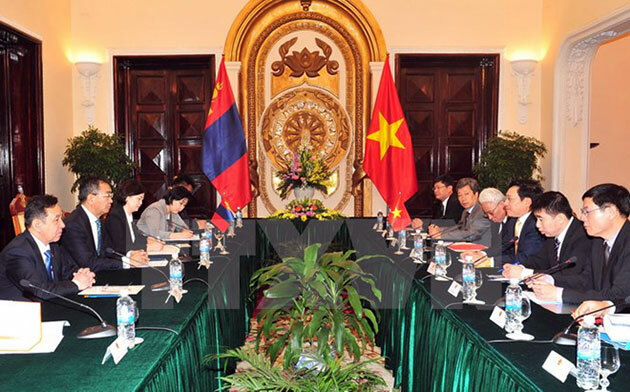 Minh suggested the two sides forge win-win cooperation in diplomacy, security-defence and economy. He also called on the two sides to seek measures to boost the import and export of goods which are their strengths, including agro-fisheries products, processed food, consumer goods, machinery, electrical equipment of Vietnam, and animal meat products of Mongolia. According to the Vietnamese official, the two countries need to early promote mutual recognition of quarantine hygiene standard, and enhance investment cooperation in oil and gas and pharmaceutical production, thus facilitating cooperation between Vietnamese and Mongolian businesses. He also asked for stronger connection in cultural exchange, education, tourism, labour, and citizen protection, adding that the two sides should consider opening flights between the two nations. Regarding regional and international issues, Minh hailed Mongolia’s deep participation in regional and international forums, and agreed that the two sides will continue enhancing coordination in multilateral forums, including the UN, Non-Aligned Movement, the Asia-Europe Meeting (ASEM), and the ASEAN Regional Forum (ARF). He also appreciated Mongolia’s stance on the maintenance of peace, stability and prosperous development in the region and the world. For his part, Tsend Munkh-Orgil spoke highly of achievements in the bilateral ties over the last six decades. He affirmed that the Mongolian Ministry of Foreign Affairs will continue closely working with the Vietnamese side to accelerate the implementation of agreements in a practical and effective manner, contributing to strengthening the Vietnam-Mongolia relationship./.